I've recently started exploring the Superstitions. 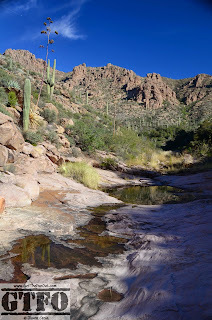 No, not superstitions like ghosts and curses, the Superstition Wilderness Area that's east of Phoenix. Despite living in Arizona for nearly 13 years, I have never hiked in the Superstitions until the past year or so when I hiked to Battleship Mountain with a backpacking meetup group. Boy, have I ever been missing out...this wilderness area is rife with beautiful desert scenery with miles of trails weaving throughout. The Superstitions, as commonly called, generally refer to the area around Apache Junction that includes the Superstition Mountains, the Superstition Wilderness area, and Lost Dutchman State Park--which includes the very popular Siphon Draw Trail to the top of the Flatirons. 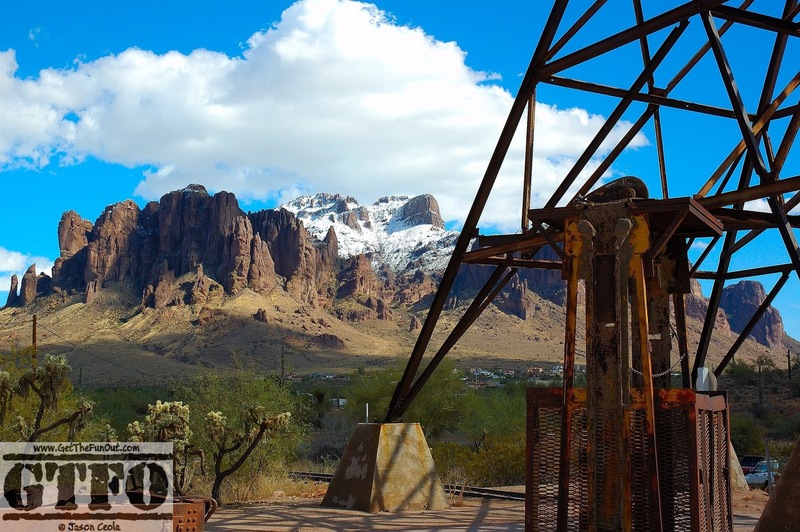 On your way to or from the north side of the Superstitions, a stop at the Goldfield Ghost Town is a heck of a fun flash back to the old west. With a saloon, merchants, and "shoot-outs" in the streets, the whole family will be entertained. If hiking or camping isn't for you, you can still experience the scenery of the Superstition Mountains and Apache Lake by taking the scenic Apache Trail drive. 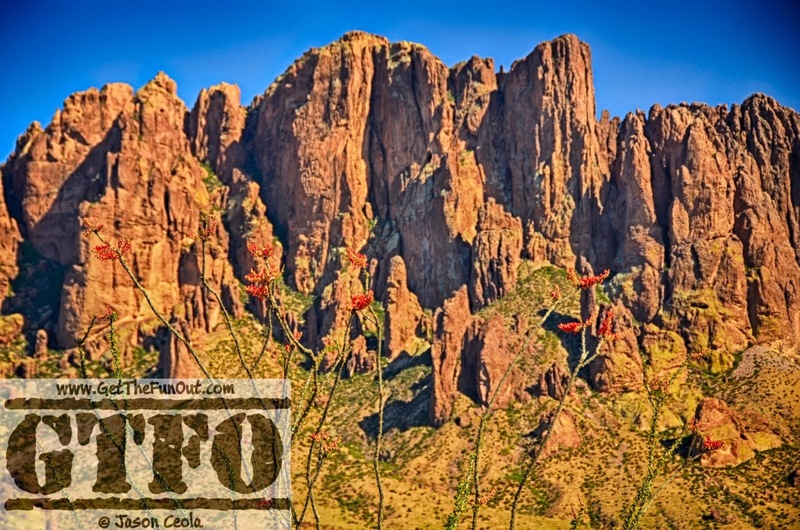 Lost Dutchman State Park offers camping in dedicated sites and a variety of hiking opportunities. There is a fee to enter the park (currently $7 per car of up to 4 adults), which is open year round. 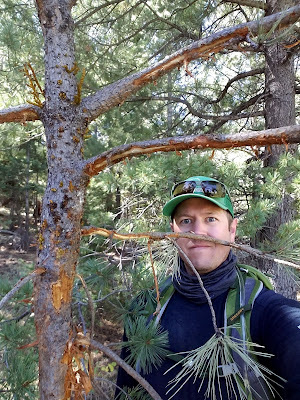 Campsites currently have a $5 fee for single sites and a total of $30 for group sites. Reservations are available through their website and suggested. Siphon Draw is the most known (I previously wrote about it here), but especially in wildflower season many of the parks trails are beautiful hiking options. 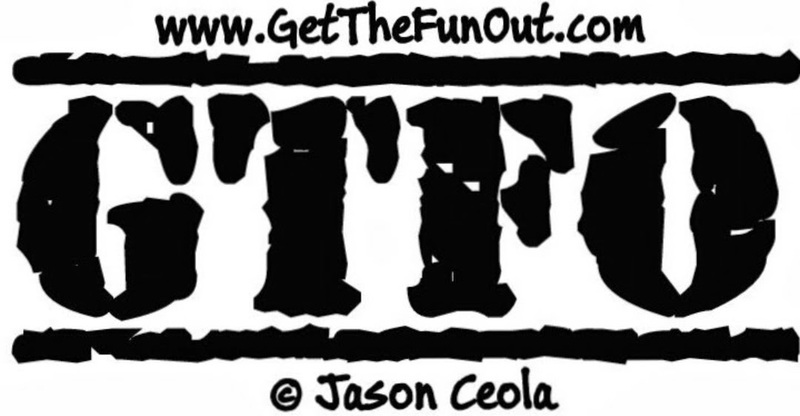 Use Gaia GPS to download trail maps to your phone or GPS device--20% off a subscription when you sign up through GTFO. If you want to venture beyond the state park, there's the Superstition Wilderness Area. This area is probably most notable for being home to the legend of the Lost Dutchman Goldmine and the many myths and tall-tales that accompany the Lost Dutchman. 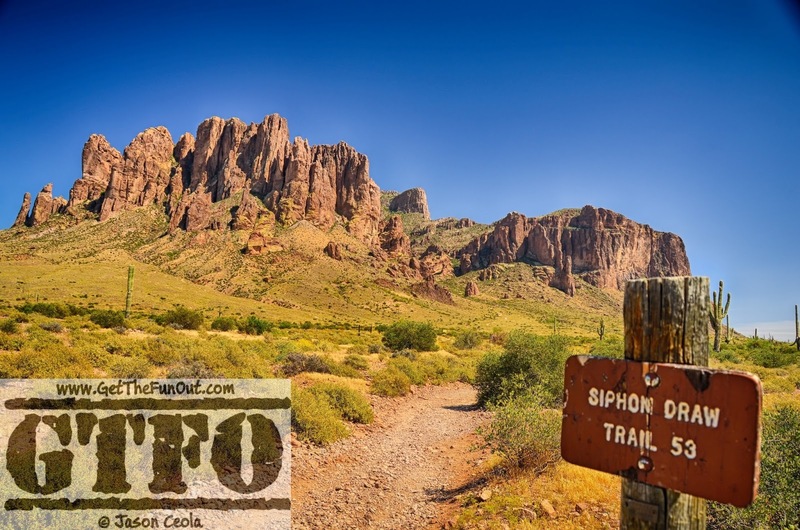 Take a short hike through the Superstitions and you'll quickly see how this Dutchman became lost and why no one has found his goldmine, if it even exists in the first place. The Forest Service webpage for the Wilderness Area lists 46 different trails contained within. These can be great for a quick jaunt into nature, a day hike, an overnight trip, or a multi-day backpacking trip. 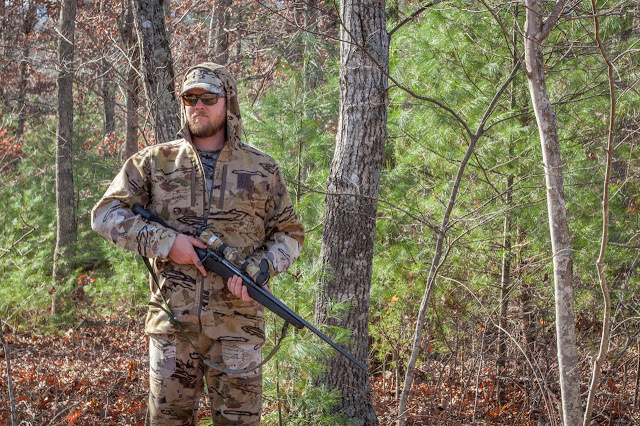 Word to the wise: if you're going for more than a day you should confirm water sources. It's also a good area to take a map because the mountains quickly and disorientatingly blend together. 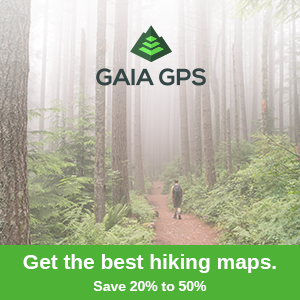 Don't expect cell phone service either so if you plan to use Gaia GPS or something similar for a phone map make sure to download them in advance. 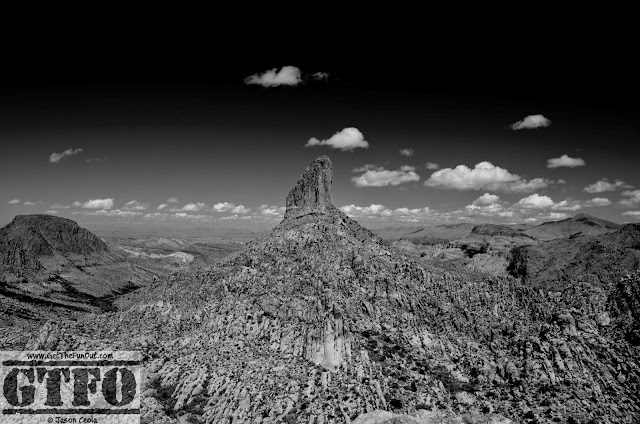 Weaver's Needle from the Freemont Saddle Overlook spur. A couple trails to get you started are, on the south side, Peralta Trail to Freemont Saddle overlook, about 6.5 miles round trip from Peralta Trailhead, for a beautiful view of Weaver's Needle; and the Garden Valley Loop, about a 9 mile lasso loop from the Dutchman's/First-Water Trailhead, on the north side for a different view of Weaver's Needle (Googling "Garden Valley Loop" gives a variety of results ranging from a 5-10 mile loop, mine was 10 miles from the horse-trailer parking taking Dutchman's Trail to Black Mesa Trail to Second Water Trail). 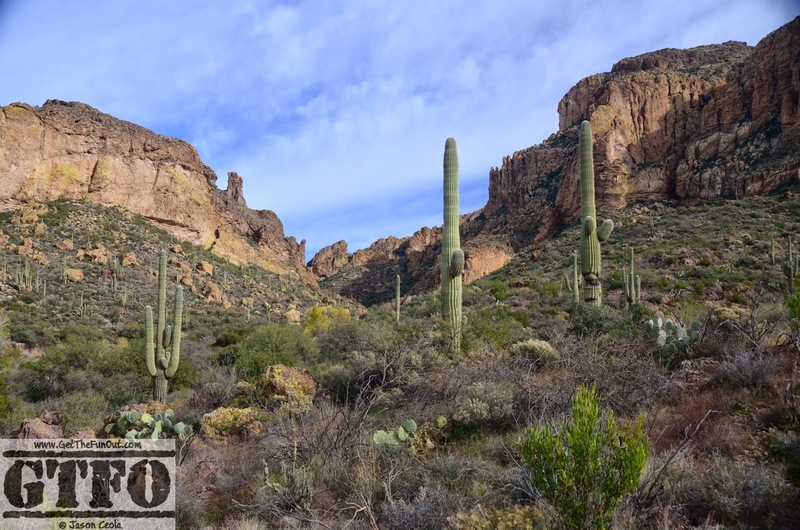 Grab a copy of Hiking Arizona's Superstition & Mazatzal Country for a list of more great hikes and get out there exploring!